We’re always excited to see brides get inventive. If you’re one of those women about to get married and dreaming to wear a gown that’s simultaneously altar and dance-floor ready, then let us help you with the right inspiration. 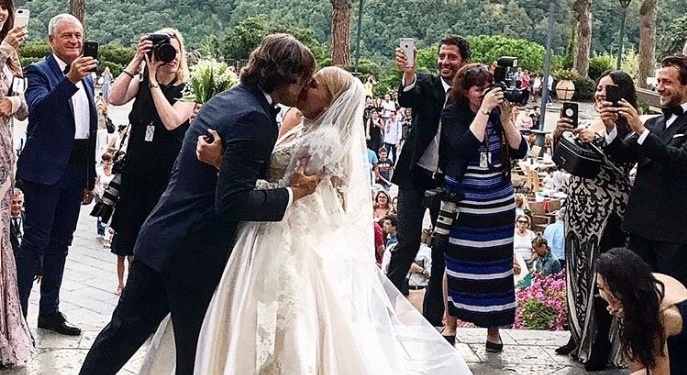 The 2-in-1 wedding gown is the hottest thing right now and Vita Sidorkina’s wedding gown has really made headlines ever since she tied the knot over the weekend. The Victoria’s Secret supermodel got married in a chic and versatile number which you can immediately add to your Pinterest board. She showed up at the ceremony choosing a ballgown that featured a high-neck lace bodice and a floor-sweeping princes’ skirt but when Sidorkina was ready for the reception, rather than swapping for a new dress, she took off the ball skirt to reveal a fresh new look. Genius, right? The dress is by Zuhair Murad design and what’s not to love about it?